Are you struggling to start your business because you don’t know the first step to take? Are your gazillion business ideas causing you to feel overwhelmed? Are you having a hard time choosing a profitable idea? Are you confused and overwhelmed trying to figure out all the things you need to do? You’re not alone! Starting a business is a huge undertaking, especially if your goal is to build a profitable business. 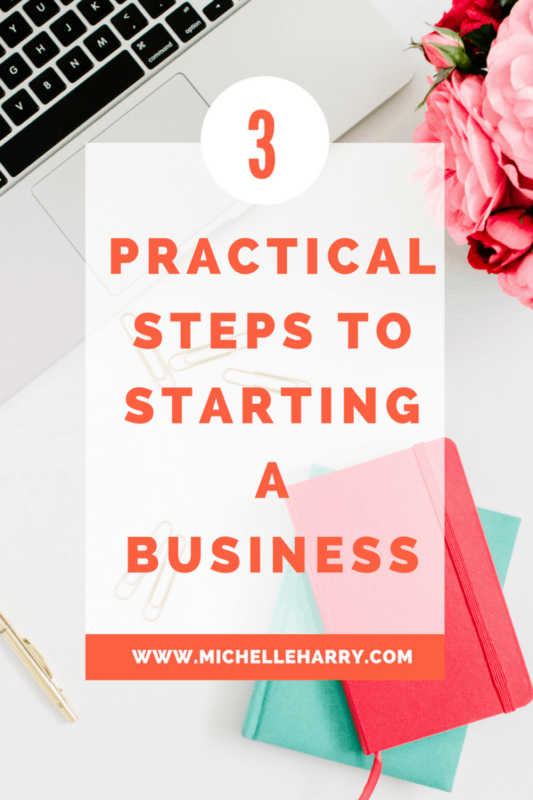 That’s why I’m sharing 3 practical steps to starting a business. This is the second post in the Freedom through Business series. This is part of a series of posts where I share how to build a successful business. 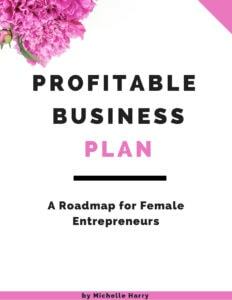 In the first post I talked about the reasons lots of women are starting their own businesses, the pros and cons of entrepreneurship, some challenges female entrepreneurs face, and the importance of having an inspiring purpose. Now we are ready to talk about some practical steps you can take to move you one step closer to starting your business. A good business idea is the foundation of a successful business. But what do you do when you have a lot of business ideas? How do you narrow it down? How certain are you that your idea is a profitable one? While there is no guarantee that a business idea will be profitable, there are some steps you can take to increase your chances of success. According to Jake Desyllas in his book Becoming an Entrepreneur (affiliate link), there are three core capabilities a business owner should strive to master so they can offer value to their customers. A business idea that allows you to showcase the three core capabilities has a good chance of becoming a profitable idea. It’s important to choose a business idea for which you have great empathy for the target audience.One of the best ways to get good customer empathy is to be a customer for your business. What solution does your business offer? Do you need (or needed in the past) the solution that your business provides? I’ve read a few stories about moms who became entrepreneurs because they couldn’t find a particular product or service for their kids.These moms went out and created the products they needed. They saw a gap in the market and they filled it.They figured if they needed these products or services, then there was a chance other moms needed them too. It’s possible to have empathy for your customers even if you don’t need the solution that your business provides. Perhaps you’re drawn to a particular idea because of a family member. You can also develop customer empathy from working with a particular demographic, and identifying a gap in the market. Knowing and caring about your target audience pain points is critical to providing great service. This is why having an inspiring purpose is so important in business. Why is it important to have customer empathy? For example, as a female entrepreneur (and a mompreneur), I have great empathy for my audience/customers. I understand the pain points of this demographic because I’m a customer for my business. Am I a customer or client for the product or service I’m thinking of selling or offering? Do I need the solution my business offers? Why is this business idea important to me? Do I really care about the target audience? Do I know and understand my customer’s pain points? Do I really care about their pain? Have I identified a gap in the market? Do my customers want or need my solution? Answering these questions should provide some clarity, and help you make a good decision. Want to know all the steps you need to start a business? Click the image below. What do you know about your industry? What are the main issues in your industry? Do you know the best marketing strategies for your industry? The best source of industry knowledge is previous work in the industry, but there are other ways you can gain industry knowledge. For example, you can join a professional organization, educate yourself by reading books, magazines, and articles written by leaders in your industry. When you increase your industry knowledge, you gain a competitive edge because you’re constantly learning about the changes that are happening in your industry. You get to know more about your customers, changes in their buying patterns, and their needs and wants. Being the first to create products and services for your customers can help you to grow your business, and position you as a leader in your industry. Before settling on a business idea, it’s important to assess your skills since you’re more capable of executing some ideas than others. That’s why you should be realistic when assessing your strengths and weaknesses. For example, I’m the least creative person in the world so a business idea that requires creativity (ahem, like a gift basket business), shouldn’t be on my list of business ideas. When considering the type of business you should start, ask yourself, how can I use my skills and knowledge to help my target audience? Can you package your knowledge into a quality product or service? Do you have formal or informal training in your chosen area? Is your technical expertise unique? Do you have a special skill, trick, or slant you can incorporate into your business that would set you apart from the competition? Is your technical expertise useful and valuable? Answering these questions will give you a realistic picture of your strengths and weaknesses, so you can identify, and work on the areas that need improvement. If you feel you need to develop your technical expertise, the first step is to learn all you can about your chosen field. Make a list of your shortcomings so you can focus only on the things you need to work on. It’s easy to get distracted with so many things clamoring for our attention. That’s why it’s important to have a learning plan so you can focus only on the important stuff. Focus on one thing at a time and ignore everything else. The next step after choosing a business idea is to decide how you want to start your business. There are three routes you can choose to start a business. You just need to figure out which one is right for you. 2. Launch a full-time business. 3. Buy an existing business or a franchise. You can start your business part-time if you’d like to test the waters before investing a lot of time and money. Countless women have grown side hustles into full-time businesses. A side hustle is a business you do on the side while employed (it’s basically a second job). 1. To earn extra income to pay down/off debt. 2. To build up your savings. 3. To help your family. I know some stay-at-home moms who started side hustles to supplement their husbands’ income. Like most things in life, there are pros and cons with this route. 1. You can validate your idea before investing lots of time and money. 2. Since you have a regular monthly salary, you can take all the time you need to grow your business without feeling financial pressure. 1. Finding the time to work on your business can be very challenging if you work full-time. 2. There’s the possibility of treating your side hustle as a hobby. Which means you may fail to invest the time and effort needed to build a successful business. 3. There’s also the risk of stress and burn out as a result of working all the time. There are other pros and cons to starting a side hustle but these are some of the most common ones. This route is a good way to launch your business if you’re self-disciplined and have good time-management skills. Since you’d likely have limited hours to work on your business, you need to prioritize and streamline your activities so you can find the time to work on your business. Which means you may have to work during your lunch break, stay up to work after the kids are in bed, work on weekends, and say no to friends and family while working on your business. The amount of time you need to spend on your business depends on the type of business you’re starting — online or brick and mortar. The side-hustle route isn’t right for everyone, but if it works for you, it’s a great way to launch your business. If you find yourself procrastinating and making excuses, try starting with a side hustle to test your idea. Check out the posts below for some more tips. Some people decide to run their business full-time after months or years of having a side hustle.This is a good option if you are earning a full-time income from your side hustle, and you are ready to grow your business, or take it to another level. This is a natural progression. Some brave souls prefer to quit their jobs to start working for themselves full time.There is no right or wrong way to start a business. As long as you have a business emergency fund, a personal emergency fund (up to six months of living expenses), and you can afford the operational costs of the business, this may be a good choice for you. It would also help if you have a support system in place. 1. You can devote more time to growing your business. Running a business full-time means you have more time to market and build your customer base or clientele. 2. It means you don’t have to work round the clock to grow your business. This would allow you to spend more time with your family and friends, and have a life. 1. It may take some time for your business to generate enough revenue, or profit to support you.This can cause some financial pressure if things don’t work out the way you expect. 2. You may lack the relevant expertise and experience in some key areas of your business. For example, you may have to learn how to sell and market your business if you don’t have prior experience in those areas. If you are an inexperienced business owner, the learning curve may be steep.This can be challenging for new business owners. It’s true that starting a full-time business can seem like a daunting task, however, it isn’t impossible.Lots of women have done it, and there’s no reason you can’t do it. Depending on the type of business you want to start, chances are there’s an existing franchising program. Buying a franchise or an existing business is an option if you have the resources and capital to fund it. Instead of re-inventing the wheel,it’s probably easier to buy a franchise or an existing business. This is a good option for people who prefer not to start a business from scratch. I know this route isn’t as popular, especially in the online space, but I wanted to mention it as an option to explore when starting a business. For any one interested in buying a franchise, this post from the US Small Business Administration is very detailed, and has a lot of useful information. You’re the only one who can decide how you want to start your business. Whichever route you take, the secret to success is choosing the right idea, working hard, learning as much as you can, and staying the course. Need a step-by-step guide to start your business? Get my Start Up Cheat Sheet: 40 Steps From Idea To Launch In Six Months Or Less. Before you start a business, it’s a good idea to think about the business structure that would give you the most benefits. You need to also consider how much taxes you’d need to pay, and the filing and record keeping requirements for the business structure you choose. Also,some business structures give you more legal protection than others. When choosing a business structure, you should consider how much of your personal assets are at risk in the event of a financial crisis in your business. Quick disclaimer. This isn’t expert advice.Please consult a lawyer or an accountant before choosing a business structure. Let’s look at some of the most common business structures, their advantages and disadvantages. Most small businesses are sole proprietorship. It’s the simplest form of business, and it’s what most people think of when starting a business. As a sole proprietor, you make all the decisions in the business, and you’re responsible for the success or failure of the business. Management. You have complete ownership and control of the business which means you can make important decisions for your business at your discretion. Tax benefits. Your business earnings are taxed once. You are allowed to pay your estimated taxes quarterly (for US business owners), and your business losses may be used to offset your income from other sources (e.g real estate, capital gains etc). Personal liability. You’re responsible for the debts and liabilities of the business. Which means you’re putting your personal assets at risk. Your personal assets may be used to satisfy the business debts. Funding. Getting loans and funding from banks is difficult because banks aren’t too keen to lend to sole proprietors. You’d need to find other sources of funding for your business. A sole proprietorship is a good choice if you want complete control of your business, and you operate in a low-risk industry (or your business is low risk). A partnership is a business with two or more owners. There are three types of partnerships: general partnership (GP), limited partnership (LP) and limited liability partnership (LLP). The main difference between the three is that in a general partnership, the owners have equal rights and responsibilities. A limited partnership has one general partner with unlimited liability, while the other partners have limited liability, and most times limited control of the partnership. A limited liability partnership gives limited liability to the owners. Which means they are not personally responsible for the debts of the partnerships, and the actions of the other partners. There are some disadvantages of partnerships that are worth considering. This post What Are the Disadvantages of Partnerships? does a good job explaining them. Check it out. A partnership is a good choice for businesses with multiple owners who wish to minimize their risks and personal liability. An LLC is a hybrid of two business structures — corporations and partnerships. The advantage of this business structure is that, the owners are protected from personal liability in the event of financial or legal problems. The LLC also enjoys a tax benefit since it isn’t taxed like a corporation, because the business owners are considered self-employed. Which means profits and losses are included on their personal tax returns. Business owners can also choose to form a corporation. There are two types of corporations: the S corporation and the C corporation. The biggest benefit of corporations is that they are regarded as separate legal entities from their founders. This means the company is liable for its debts and actions and not the founders. The major disadvantage is the cost of formation and the amount of record keeping that’s required. It’s a good option for businesses in high-risk industries, or businesses with medium or high risk. It’s important to consider the right business structure for your business from the beginning. While it’s possible to change your business structure later, bear in mind that it could be a more expensive and complicated process. So think carefully before making a choice. If possible, choose a business structure that you can grow into, and be sure you get good advice from a professional before you make a decision. To recap, choosing the right business idea will go a long way towards helping you build a successful business. The best idea is the one that allows you to showcase the three core capabilities. You can gain industry knowledge by investing in resources that teach you about the industry. Which means as a new business owner, you need to learn all you can about entrepreneurship so you can grow your business. Starting and growing a business can be rewarding, all it takes is hard work, commitment, and a willingness to learn and adapt. 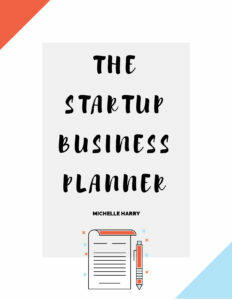 Don’t forget you can get my Start Up Cheat Sheet: 40 Steps From Idea To Launch In Six Months Or Less, if you need a guide to help you start your business. Have you started your business? Which route did you take? Have you decided on a business structure? Leave a comment or question below.